Are these reports overblown? Is our infrastructure really crumbling? If so this could spell some serious problem in case of disaster? I think that it is probably the case in some poorer areas. But my guess would be that the major cities don't have as big an issue. Its hard to say but it must be addressed and soon. keeping up an infrastructure is expensive, and when the gov't gets involved, even more so. Take the Bell System, those guys who strung wire and set poles across the nation. Back a few decades ago, some know it all judge, decided that Bell had to "share" everything they had put in place with the new players. It did not take long for that otherwise reliable, profitable business to die. We used to have a federal highway trust fund (kind of like the one for social security) and I guess we still do, but the politicians have robbed it to fund more important things. Google some of the fed gov't spending to get an idea of what IS way more important. Well it is now broke, and the roads and bridges are no longer, have not in decades, being repaired or kept up like they should. Many states are solving the roads problems by "selling the rights" to a private entity with the gov't blessing for them to turn it in to a toll road. Same for the myriad pipelines that run underground throughout the US. Same for the power grid and power transmission lines. Same for public transportation. The quasi gov't Amtrak/Conrail debacle of train travel in the US would have disappeared for "people" movement decades ago with out the near 100% subsidy by that federal gov't. It goes on and on, and while a few reports document the ever present political boondoggle, the majority are accurate and only after a significant failure or compromise will WE do anything about it. Poorer areas really have little to do with it, it is pervasive and will only get worse as time moves along. The big cities are worse off than the burbs, as infrastructure is worn down by constant use....the cities beat on everything, much worse, than the burbs. It is not a topic any pol is willing to bring up, so addressing it, except by funding some study from the pol's home state, will not happen. Several elements of the US infrastructure are crumbling. And many of the cities have it worse than rural areas. Though that is more a matter of higher dependence on the infrastructure in the cities than in the rural areas. The actual roads, pipelines, power lines, and such are just as bad in the rural areas, sometimes worse, but those in rural areas often have options. Those in the cities seldom do. When their power goes out there are no generators sitting outside the garage to power up the fridge and some lights. Or when the water goes off, those in the rural areas can go to a pond or river or have a well that they can get water and purify it if necessary. Those in the cities seldom have this option. The actual physical aspect of US infrastructure is mixed. There have been some maintenance catch ups, some new installations, and some upgrades here and there. But for the most part, the aging systems are deteriorating faster than maintenance can keep up, much less upgrade or replace. And the worst thing about the infrastructure is the choke points in each one. Even where there are large parts of a system in pretty good shape, somewhere in that system is a part or something, not in great shape, that if it fails, the whole system fails. Be it one bridge in a road system, one switching station in an electrical system, or one pumping station in a water or sewer system. If that one element goes down, the rest of the system cannot be used. Then there are non-physical aspects of the infrastructure, such as JIT or Just In Time delivery planning. Most food stores use JIT deliveries. They do not warehouse foods on site. They get deliveries very day to every three days and stock the shelves immediately or shortly after the delivery. There is nothing in the back to replace the things on the shelves when those items are purchased. Not true in every case, but in more than enough to create the situation where there will not be any additional food supplies for the duration of a disaster after three days. JIT is not the only way of doing business that affects the infrastructure. Related to JIT is the no warehousing of many other things. Business do not like to tie up capital in product in warehouses when it can be earning money in other places. The US government no longer keeps much in the way of strategic supplies of foods and other items to keep the population alive in the event of some disasters. Along with that, is the separation of the sources of supply from the point of use. Very few places are self supporting to any degree for basic human needs. Nearly everything has to be brought in, and then waste taken away, often for hundreds or even thousands of miles. Without the transportation systems up and running, people will not get what they need to live. As can probably be discerned, I believe the infrastructure, in the US for sure, and in many other places, is one of the major disasters just waiting to happen. 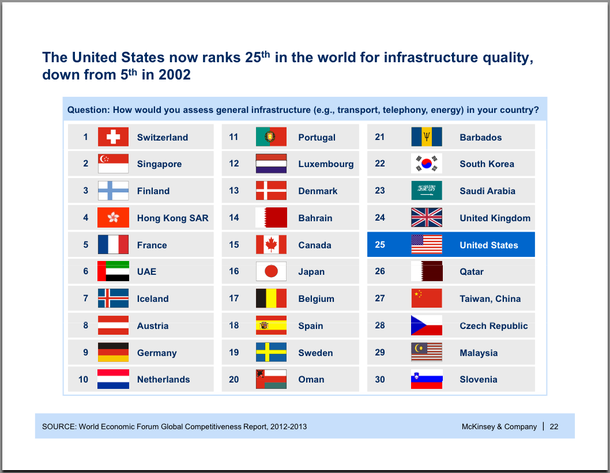 The United States ranks 25th in infrastructure, which is pretty bad for a developed nation. Business Insider has details here. Jerry D Young and kd3pc like this. I think we might be taking things for granted as a country and assuming that everything will be ok. But while we lolly gag, it could cause serious problems. The sad thing is that our country has a tendency to wait until disaster before changing policy. I just hope that does not happen with our nation. So the superpower appearance is just a facade. Despite having a strong military and a burgeoning space exploration industry, officials have pretty much neglected some of the basic services they're supposed to provide their citizens. People would expect this much from America since they're a developed nation. Infrastructure is a never ending process. Many parts of the nation are going to be older than others just by nature. Also funding plays a big role in being able to update and fix things. New York being one of the oldest cities in the nation has a lot of old structures and systems that have been updated and replaced over the years and will continue to update and replace. Generally it's usually more cost efficient to rebuild and fix after a disaster because there's less headaches to deal with such as working around traffic, repairing support structures before a system can be repaired, ect. Cities will put off funding such projects as much as they can in order to 'save money' and have it funneled elsewhere. Much more like the wizard of OZ, there is some guy/organization/alien making things appear to be....normal. While the US still has a strong military, a few years back our president reassigned NASA to a more prudent task....http://www.foxnews.com/politics/2010...tions-muslims/. Not much else registers a tweet, unless Kim K...burps or shows her assets. We, Americans are so far upside down on the important things in life, that there is little chance of turning it right side up, any time soon. Our sewage systems, when they work, are a marvel of engineering. For something that was designed and built in the early 1800's. Our roads are designed to traffic use of today, so by the time they are built/widened 10 years hence - grid lock prevails. Our power system is one rat bite away from state wide outages. One state implemented a "flush tax" to finally separate the sewage from stormwater, but found the income too lucrative to waste on waste water management. The USA is in debt to foreign nations to the tune of almost 20 Trillion dollars, and prints money faster than a one armed paper hanger. Yet we still ignore, or to be more accurate - use a form of accounting, "cost avoidance" when it comes to things a 21st century nation and it's citizens "need". Sadly infrastructure is seldom in the top 20 things the gov't ignores. Yet our president will be the first to "encourage" our form of republic on every developing nation that will pause in their survival to listen. Meanwhile our "slums" are middle class compared to most of the world. Even our "homeless" live better than the ghettos of South America I have seen. Yet we decry how horrible our poor people suffer. Compared to What? Or Whom? The infrastructure problem is not just a US problem. It's a worldwide problem, the way they tackle the infrastructure problem here in Canada is to build more toll roads, they also make you by a sticker when you renew your license just for tax purposes, It's really quite pathetic. You would think after all these extra taxes. the infrastructure problem would be dealt with, but that's not the case. The bridges are still falling apart, the roads are treacherous to drive on because the snow plows might come out four times a year to plow the roads, that's because of course they have a quota of how many times plows come out in the winter, that means drivers have to make sure their car is up to power to tackle not just the potholes in the road, but the buildup of ice and snow on the roads. I'm surprised to see my country at number 24. Things seem pretty efficient to me. OK, the roads are full of potholes and the public transport system is a mess, but we almost never have any issues with utilities, sewerage and clean water. I don't take surveys and rankings done by any group serious and accurate. If they didnt check every building in the that country, then it isn't accurate at all. They can go out and pick 10 building and that won't reflect the country as a whole. Sure inspection codes are constantly being upgraded. We should have all federal and state building inspected, assessed and fixed. Private home are to be done by owners. Nothing we can do about that. If any of you have actually traveled to other countries you will see how big of a difference is in quality of the buildings. USA is light a becan of light compared to the places I've seen and visited as far as building safety and quality.